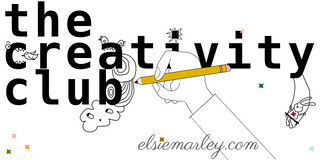 before i blogged, i posted photos of my projects on flickr. one name i noticed popping up over and over in the groups i visited, consistently sewing classically lovely projects, was “saganaga,” aka rachel of nest full of eggs. i adore her creations, from this tutu to this abbey jacket to this dress with crochet trim and so much in between. rachel’s style is peaceful, beautifully simple, always classic, and i’m so happy to have her kick off vintage may today with a sweet little holly hobbie outfit! she took these photos on the actual prairie! so cool. 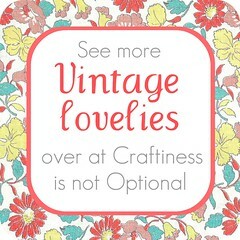 Thanks so much Kristin for inviting me, I was thrilled to be asked to contribute to the Vintage May series. Playing dress-up is one of my 4 year old daughter’s favorite things to do and the Vintage May series inspired me to sew her a Holly Hobbie outfit. 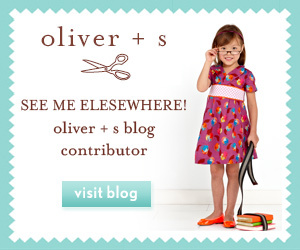 Do you know who Holly Hobbie is? If not, she is a patchwork pinafore-wearing little girl in a giant bonnet, a nostalgic sweetheart who was symbolic of simpler times. She wears a late 1800s period dress like Laura Ingalls from Little House on the Prairie (you know, the TV show which ran from 1974-1982) which takes place in Walnut Grove, Minnesota, which is just a few hours drive away from where I live. I was out shopping at vintage shops in my area and saw this child’s Holly Hobbie sewing pattern, it was so super sweet, I immediately grabbed it right away (of course! )… it was size 4 ~ perfect for my 4 year old daughter! 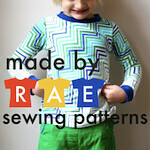 I was thrilled because vintage sewing patterns come in only one size. The pattern is Simplicity 5996 from 1973. 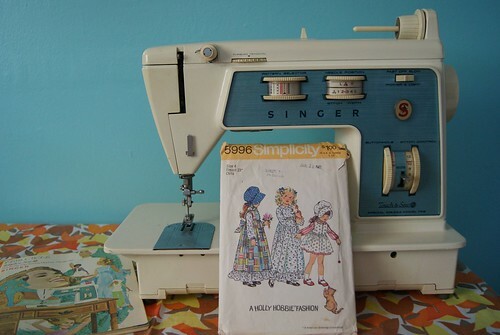 That’s a photo of it by my vintage 1970 Singer Touch & Sew sewing machine with the original instructions manual. 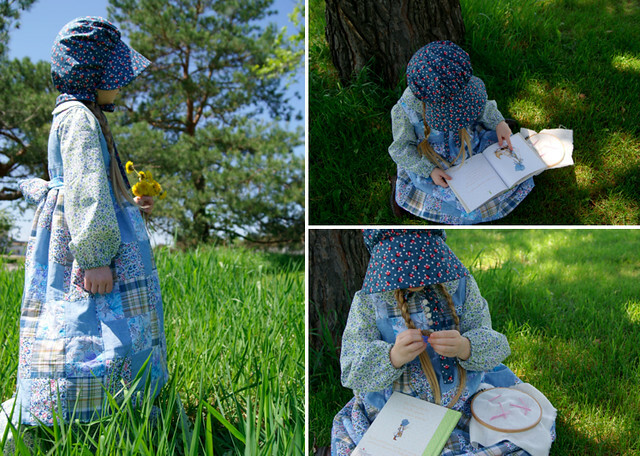 I sewed my daughter the long dress, bonnet and long pinafore using fabrics that are available today. It was fun looking and shopping for cute calico cotton floral prints. 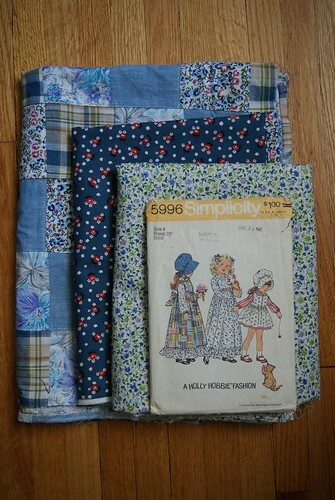 I tired to stay true to the classic Holly Hobbie by sticking with the same colors/types of fabrics. I am sure you have already seen this blue floral fabric floating around sewing blogs or maybe you’ve already sewn something with it ~ it’s from the DS Quilts collection from JoAnn’s. It’s blue with little red and white flowers ~ absolutely perfect for the bonnet. 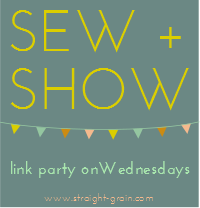 The patchwork fabric is already pre-sewn that way (saved me a ton of time! ), that’s available at JoAnn’s as well, you should expect to pay about double the price for that type of fabric, but it so worth it. And the white floral fabric I got at a warehouse fabric store. 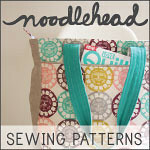 Just for fun, for the lining of the pinafore, I used a white cotton with light blue polka dots (from my stash). I wanted to follow the 1973 pattern as close as I could, but I did make one modern change and that was instead of adding 3 buttons to the back of the pinafore I added 3 strips of velcro because it’s being used for dress-up and velcro makes it easier to take off & put on. 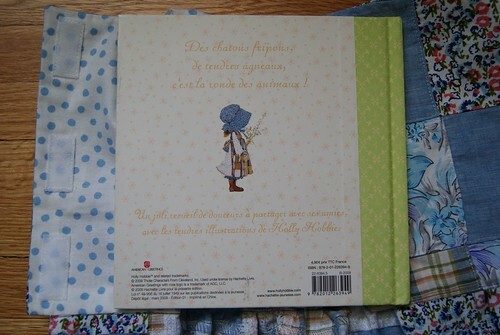 By the way, the Holly Hobbie book in the photo is in French, it came from Grand-Maman & Grand-Papa (my daughter’s grandparents) who live in France. 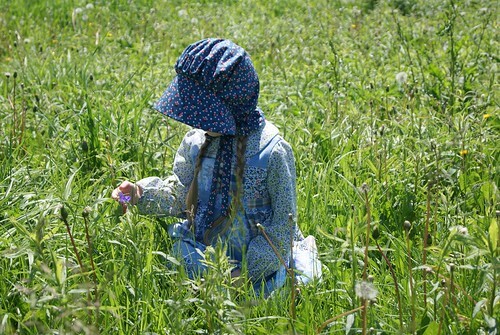 My daughter enjoyed discovering flowers, running, hand sewing, etc. 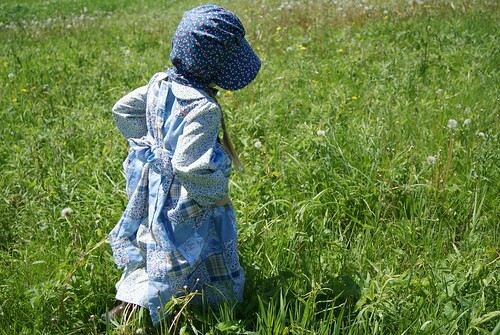 on a Minnesota prairie in her new Holly Hobbie outfit. thanks so much, rachel! what a great dress-up outfit, and your little gal is so sweet. please head on over to craftiness is not optional to check out a beautiful vintage-inspired dress by jess’ first vintage may guest, lindsay of the cottage home! Loving the palette here and the different fabrics. And I can’t help but thinking how sun smart this outfit is! I was thinking the same thing about how sun smart this is, the only exposed skin are the hands, over 100 years ago, they didn’t have sun glasses or sun block, so they had to cover up in fabric, otherwise you’d get sun burned – ouch ! My mom has this pattern and she made both my sister and I outfits back in the late 70s/ early 80s? I had loved Holly Hobbie as well as Little House on the Prairie so this post certainly brought back some lovely memories. Thanks. you mom still has this pattern !?! how nice ! this is adorable! i was a big Holly Hobbie fan back in the day – might have even had a Holly Hobby themed birthday party at one point :). that bonnet is my favorite, and the fact that she’s working on her embroidery!! darling! I loved Holly Hobbie when I was little! I had HH bedspread, wall-hanging, dolls. Just recently I was tickled to find a HH cake pan at a garage sale. This little costume is wonderful! Your daughter is adorable! you had quite the HH collection ! 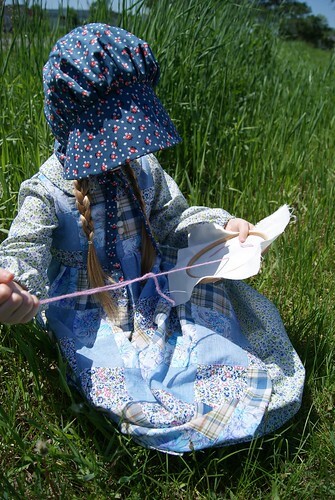 I also grew up in the era of Holly Hobbie, and I read the Ingalls WIlder books, and of course I would have LOVED a little dress-up outfit like this when I was a little girl. The bonnet!!! Oh, it’s just wonderful. Well done!! Just gorgeous! I had a Holly Hobbie nightgown when I was small. I’m feeling very nostalgic! Beautiful work Rachel. Everything about this project is perfect. The photo shoot, execution, and fabric selection. Absolutely gorgeous. Rachel, you did an amazing job! I loved everything of Holly Hobbie when I was a child! Thanks for this sweet revival! Oh! I loved Holly Hobbie when I was a little girl, I wanted to be just like her!! So lucky for your little girl to have such a beautiful costume. thanks so much Vanessa !